Larvae of this day flying moth host on Snow Bush and often times will literally strip every leaf from these shrubs suddenly disappearing (underground) to pupate. They are currently in the process of stripping my Snow on the Mountain bush. Anyone have any suggestions to destroy them that is safe for the other animals/reptiles around? I'm in Ft Lauderdale and we have many small wild lizards which I do not want to harm. The safest thing probably available is BT, short for Bacillus thuringensis. This is a bacteria which attacks insects; the protein produced by the bacteria that kills the insects is also called BT. 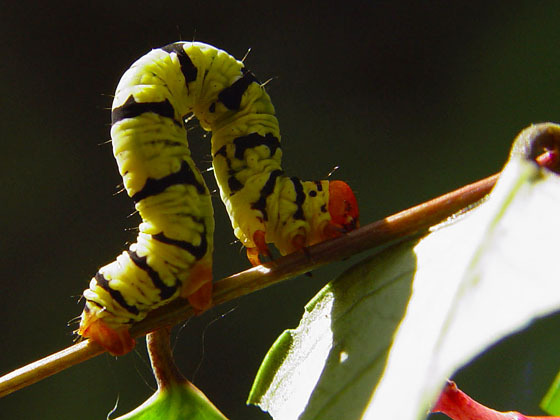 There is a strain of BT commonly used for control of gypsy moths which also affects other lepidoptera (a different strain attacks diptera and is used to control mosquitoes). Note that it will also kill off other moths and butterflies, not just this one species; but it is harmless to lizards and other vertebrates, except that it kills off part of their food supply.